The versatile Stretch Out Strap, packaged with a convenient exercise wall poster. This 16"W x 21"L poster displays 20 stretches featuring contract-relax techniques for promoting flexibility to various areas of the body. The poster is conveniently rolled into a tube and is packaged with a Stretch Out Strap inside. Strap is approximately 6'4"L; green. 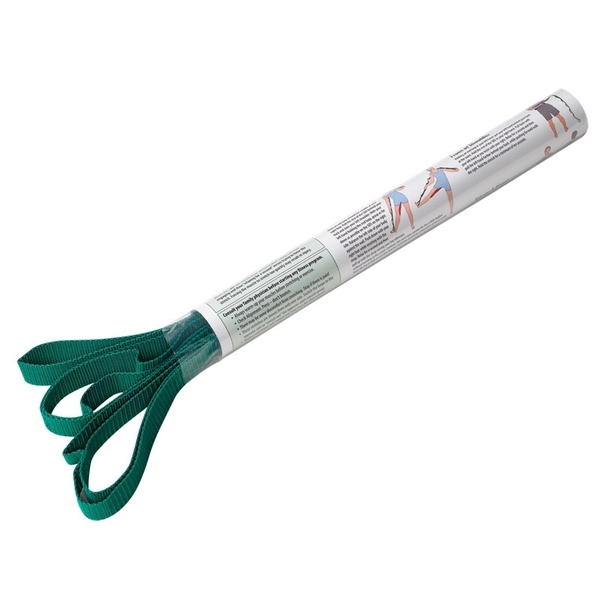 The Stretch Out Strap is an essential tool in the individual&apos;s home kit. Facilitating flexibility is a must for older adults to maintain balance. I&apos;ve used this Stretch Out Strap at my gym and I love it! I used to us a yoga strap but I would have to keep adjusting it. With the Stretch Out Strap, the stitching allows me to easily change the amount of tension and the variety of stretches without adjusting the strap. Can&apos;t wait to get one for home use. It&apos;s wonderful for stretching legs in various positions. Having the different segments in the strap is very useful to control the different stretches. A perfect flexibility training tool!